Victor Valley Transit Authority processes an average of 50 invoices a week. Processing these invoices from receipt to check payment used to take 8 to 12 man hours. With Laserfiche Workflow, the processing time has been reduced to just a few hours. Managers said they had not received the invoice. Managers returned folders that didn’t include every invoice. To alleviate these issues, the A/P clerk made copies of every invoice before delivering them to the appropriate manager. When the managers returned the invoices, she reconciled them with the copies she had made. Once the copies were approved, the A/P clerk coded and handed them over to the finance director for review. The finance director checked the codes and handed the invoices back to the A/P clerk to be entered into the accounting system. Once all the invoices were in the system, the A/P clerk printed a report and handed it back to the finance director along with the invoices. The finance director made sure everything was entered correctly and sent the invoices to the treasury department. The treasurer reviewed everything, initialed the invoices and printed checks. The whole stack was then passed to the executive director who performed another review, initialed and signed the checks. Everything was then delivered back to the finance director who brought them to the A/P clerk. The A/P clerk made a copy of the check, stapled it to the invoice and mailed the original check. The A/P clerk then filed the invoices in a file cabinet. 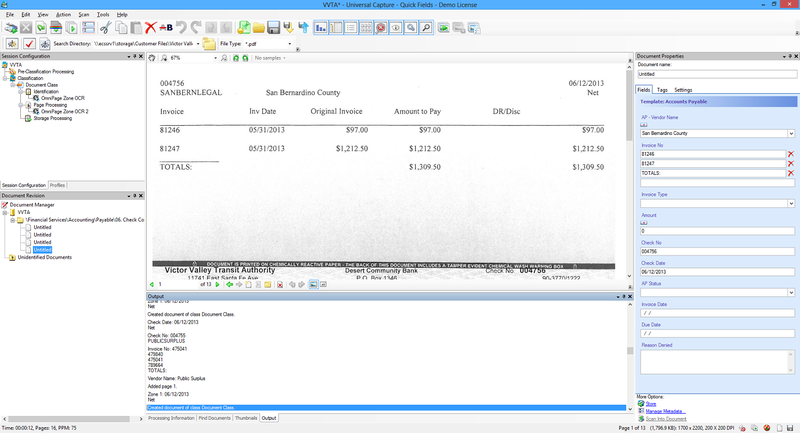 Now, after an invoice has been received in the mail, the A/P clerk scans it directly into the Laserfiche folder of the manager associated with the invoice. Laserfiche Workflow sends an email to the manager notifying him that he has a new invoice to approve. If the manager doesn’t review the invoice, he receives automatic email reminders until he takes action. 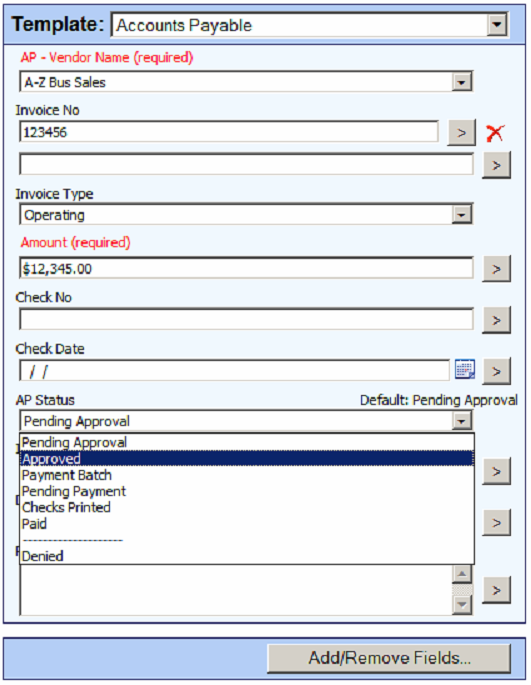 To approve or reject the invoice, the manager changes the value of the A/P status field. If the invoice is rejected, the manager must also specify the reason in a new field. Rejected invoices are routed back to the A/P clerk, who makes the corrections and resubmits them. 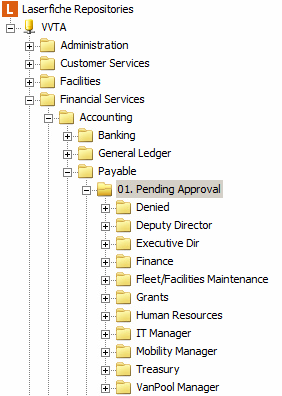 Approved invoices are automatically moved to the Approved folder. Every week, the A/P clerk initiates a Laserfiche Workflow business process for all of the invoices in the Approved folder. This workflow moves the invoices to the Payment Batch folder, locks the payment batch in place so that even if new invoices are approved, they will not be part of that particular payment batch. The A/P clerk enters all the invoice information into the accounting system and generates a report that is emailed to the finance director along with a link to the Payment Batch folder. The finance director reviews all of the invoice totals and checks them against the report. The folder columns are set up so that all of the relevant invoice details are viewable without opening the specific documents. He then approves or denies the invoices. 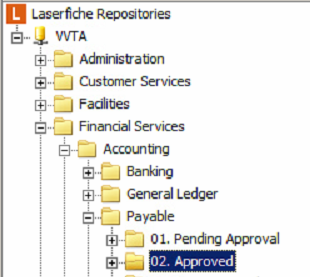 When all of the invoices in the Payment Batch folder are ready, the finance director starts a Laserfiche Workflow business process on the folder. This process then moves the invoices to the treasury department’s folder. The assistant treasurer reviews all of the invoice totals in the Treasury folder and looks for any anomalies. The treasurer then prints the checks and checks the total check run against the total in the Laserfiche batch. 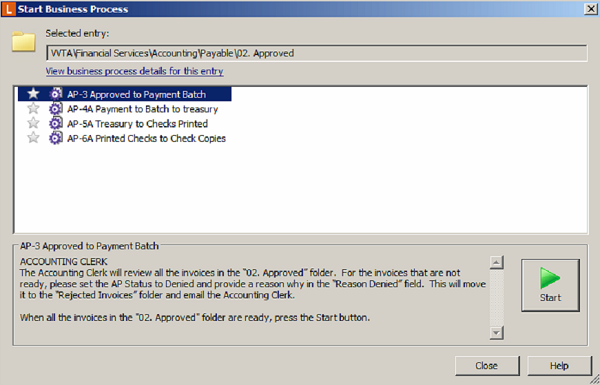 If the totals match, the assistant treasurer initiates another Laserfiche Workflow business process, which moves the invoices to the Checks Printed folder. This workflow automatically sends an email and text message notification to the executive director, who must review all of the invoice totals in the Checks Printed folder and check them against the total associated checks. Once the executive director reviews the invoice and check totals, he starts another Laserfiche Workflow business process, which sends an email notification to the A/P clerk. If the executive director is in the office, he signs the checks and passes them back to the finance director. If the executive director is out of the office, he starts the business process remotely on his mobile device. This serves as the go ahead to mail the checks without his signature. 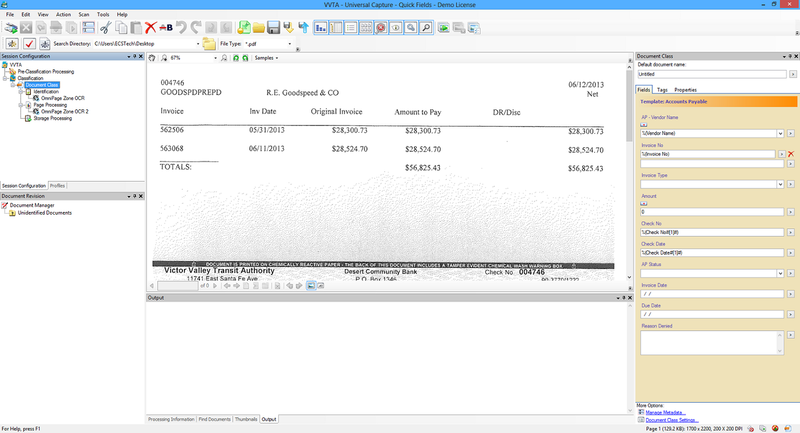 If the checks are approved, the A/P clerk scans them into Laserfiche with Laserfiche Quick Fields. 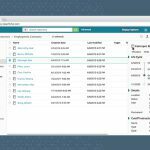 Laserfiche Quick Fields automatically extracts the vendor name, invoice number, check number and check date from the document and uses it to populate the metadata. Once the checks are scanned in, Laserfiche Workflow appends the checks to the appropriate invoices and files everything away in the Paid Invoices Folder. The A/P clerk then mails the original checks to the vendors. Throughout the entire process, every action is automatically recorded in a sticky note on the invoice. It is very easy to see all the steps that the invoice went through simply by looking at the sticky note. Invoices are never misfiled. In the past, the A/P clerk would sometimes file invoices for the same organization in different folders (e.g., The City of Hesperia could be filed under “T” or “C” or “H”). Payment now occurs within 48 hours of the invoice being scanned into Laserfiche as opposed to a minimum of a week with the old system. Invoices are never lost since the originals never leave the A/P clerk’s desk, and one centralized copy is always stored in Laserfiche. Time is saved due to automatic routing of invoices between approvers. Invoices can be approved remotely. The executive director, who travels a lot, can now approve checks and invoices remotely, allowing them to be mailed much quicker than before. Accountability has improved. 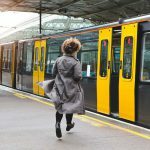 The entire history of the invoice, including the name of every approver and date of each approval is contained in the automatically generated sticky notes. Automating accounts payable requires preparation, collaboration and an honest look at your existing processes. Get the free guide and learn how to automate A/P the right way.